Although the Nahe is a dry region, Dönnhoff does not water their vineyards as to encourage deep rooted vines. The soil is covered with organic material like straw and compost to preserve water and to avoid evaporation and erosion in heavy rains. The vines are all grown on wire frames, low to the ground to benefit from the warmth of the stoney topsoil, and at a density of approx. 6000 vines per hectare. 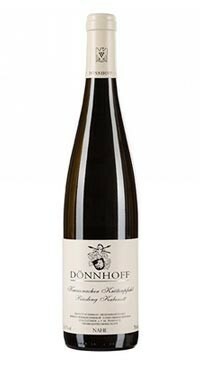 Grapes are always picked by hand at Dönnhoff over 2-3 passes through each vineyard. The Kreuznacher Krötenpfuhl vineyard has excellent drainage due a crunchy topsoil of pebbles over loam soil; characteristic of wines with a mineral-driven elegance. Due to the water table that flows beneath the vineyard’s soil ,the Krötenpfhul has always been farmed organically. This wine is light, lean, bright and with a touch of minerality. Notes of elderflower and white nectarines. Medium sweetness and high acidity.